A new receptionist. A mysterious death. A talking cat. A haunting. A village in disguise with dark secrets. The Woodend Cottage Hotel has stood at the end of Millerfield Village, Kent, for as long as anyone remembers. Miss Laura Howcroft has been receptionist for only three months. The naturally suspicious villagers eye her with suspicion as a “foreigner”. Fortunately, the villagers don't know just how unusual Laura is. While in every other respect she is an ordinary, if beautiful, receptionist, she has an extra-special ability: she can talk to animals. Especially Monty, her cat. And she can understand what they say back. 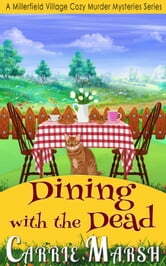 When small items start going missing from the hotel, the cook pleads insanity and Farmer Hogarth takes a funny turn, level-headed Laura is the first person anyone asks for help. Laura tends to treat the village goings-on with humor. But then a visitor from London is found dead, and she must take it seriously. Then, the finger of suspicion points at her, and she must do something to clear her name. Braving dangerous threats, ghostly sightings and stale apple pie, Laura delves into the dark side of village life. By her side is Howard Lucas, a gentle and soft-spoken doctor with a black-belt in karate, and the indomitable Monty. Can Laura uncover who is the murderer and what’s the motive. Could she survive those death threats? 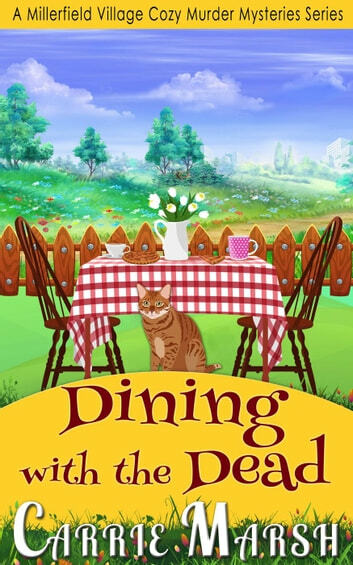 Dining With The Dead is a gripping standalone mystery in Carrie Marsh ’s second Cozy Murder Mystery series - A Millerfield Village Cozy Murder Mysteries Series. With plot twists, turns coupled with interesting characters that you will sure love. Buy this book because it’s cozy very good! Just $0.99 for a very LIMITED TIME OFFER only! Not a good book. No character depth and explanations of how things happened. As a previous review said, many mistakes, even called the main character by the wrong name at one point! I'm afraid I would not bother reading it. Lovable characters. Small town mentality is the same everywhere. An easy read that relaxed me. Will read more . cozy mystery, contemporary romance, England If you like a quick cozy that makes sense, and a gentle romance, this one's for you. Not much longer than a short story, it's a real feelgood kind of thing. I do look forward to reading more in the series.